A round-up of all improvements and changes to the Buzz platform in version 2.0.73, available on October 20, 2016. Updated grading tools for Multi-Outcome Scoring courses. 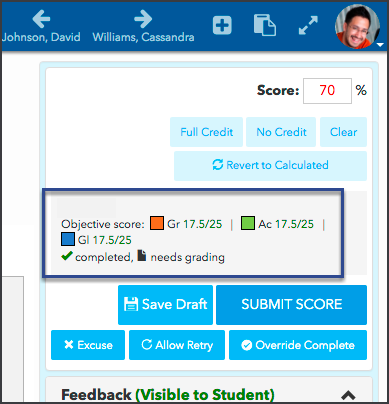 To improve visibility into how scores are distributed in Multi-Outcome Scoring courses, we revised the Grade Editor and Activity Grader for assessments to show updated objective scores as the grader makes changes to the assessment score. In the Activity Grader, where all student scores appear in a column, graders enter assessment scores as a percentage. Updated the student Grade Details modal to show full screen for SCOs that support review and for custom review items, in all other cases, it continues to appear as it did (about half of a 1024 screen width). [Safari] Fixed issue that was causing images to fail to appear when using Safari. Fixed an issue that shifted the focus for students when they were completing ordering questions. At times this could cause the page to jump. Fixed an issue that was hiding the teacher's options for recipients (send to recipients, send to recipients and observers, etc.) when sending messages with the Clipboard. Fixed an issue that caused users to get a navigation error when trying to open a Course Link from a message sent to everyone in the course. Fixed an issue that caused Course Links to appear as plain text in messages when including multiple course links. Added messaging to indicate that a question edited for a student group applies to wherever the question is used. Fixed an issue that was causing an item's visibility settings to appear altered when users moved the item. Fixed an issue that caused activities moved from a Choice Activities folder to another folder to appear in both folders until refresh. Fixed an issue that wouldn't allow users to attach a resource or image to an item if the folderpath attribute had a colon. Although colons are now supported with this workaround, users should not use colons in folderpath attributes moving forward. [IE 11] Fixed an issue that caused all integer-only and whole number input fields to reject number entries. Added DOCTYPE html to custom question iframe. Fixed an issue that was sometimes causing assessment and homework questions to be removed when the users hit the backspace. Fixed an issue that kept users from previewing more than one question or question bank in a session. Fixed an issue that was causing Score History screen to sometimes swap entries when they occur at almost the same time. The Score History now shows rows without disrupting the order for rows that happen almost simultaneously. Updated the gradebook to ignore erroneous project group configurations on activities that have been imported or linked to from another course. Formerly, when you tried to open Grade Editor for such an activity, it opened the Group Grade Editor for the non-existent group. Now, it opens the Grade Editor for the clicked student enrollment. Fixed an issue that kept Multiple Choice questions from awarding partial credit correctly. Updated the Calendar to both show an X next to excused activities, and added code to filter out the excused activities if the user option to hide excused activities is set. Fixed an issue where an assessment question could erroneously load a master coures's question when it was edited in the derivative.